The Place Opened about two months ago, Hiryu is a relatively new contemporary Japanese restaurant along Tras Street which focuses on Omakase and ala carte dishes. Hiryu literally means flying dragon, and is helmed by Chef Raymond Tan whom previously held stints at Sushi Jin and Sushi Murakami. Occupying two levels in the shophouse space just a few doors down from Hokkaido based Baristart Coffee, the interior of Hiryu is dominated by wooden furnishings, with a subtle hint of a dragon’s silhouette on the side wall. Most of the seats are also interactive counter layout, where you get the chance to watch the chefs at work. It seems like there have been quite a couple of new fine dining Japanese restaurants which opened in the past few months, with the likes of Sushi Ayumu and Hashida Sushi. The Food Lunch Omakase Set starts from S$128++, while dinner Omakase starts from S$188++. Otherwise, you can go for the ala carte selections which are quite well-varied. From the appetisers section, the Uni Tempura (S$42) is something I had for the first time. The batter of the tempura is wrapped with seaweed and fried to a light and crisp texture, while it is filled generously with the sea urchin. I was quite impressed with this dish as it is not easy to get the tempura batter right. The other appetiser I had is the Uni & Toro Truffle Bruschetta (S$64). Think of it as an upscale toast where you get chopped tuna with sea urchin, caviar and truffle on a crispy toast. Wagyu beef sandwich toast is all the rage since my Japan trip last year, and it is now a trend is some of the high end Japanese restaurants in Singapore. The Hiryu Wagyu Sando (S$58) here uses Miyazaki A5 wagyu beef, and there is another surprise in the bread. There is also the element of sea urchin being spread on the white bread, which adds to a different layer of flavour as opposed to other wagyu sando I had previously. If you are having the Omakase course, there is an option to go for either the Hiryu Premium Don (S$85 for A3 Beef/S$115 for A5 Beef) or the Chilled Truffle Angel Hair (S$75), which are also available on the ala carte menu. 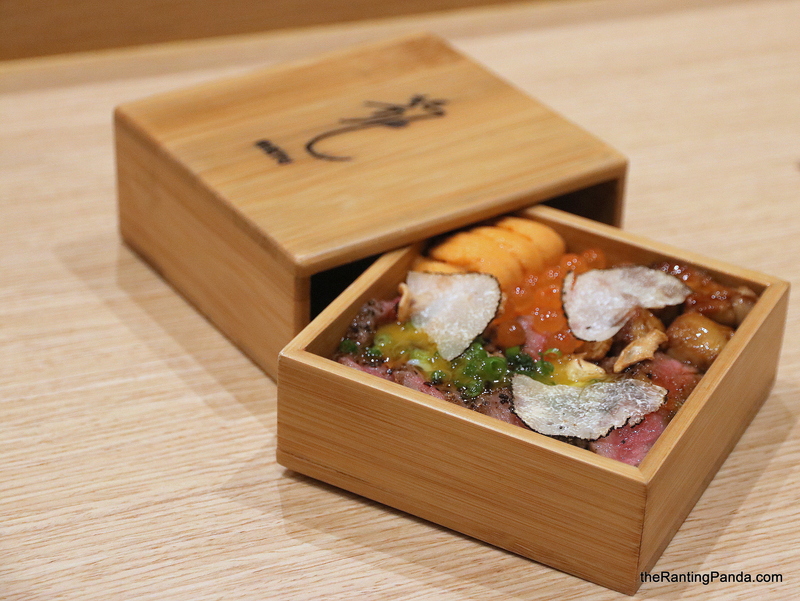 My preference is the Hiryu Premium Don, which has all the ingredients I love – A3 Miyazaki wagyu beef, foie gras, ikura, black truffle and onsen egg. One noteworthy mention is the use of Hokkaido Yumepirika rice, which has such a soft texture. The combination of ingredients here is formidable as well, especially the succulent, well-marbled and highly prized wagyu beef slices. Comparatively, the Chilled Truffle Angel Hair has sakura shrimp, scallop, sea urchin, caviar and shaved truffle on the cold pasta. The ingredients are premium, but the rice don option works better for me over the angel hair pasta. Other sushis I had from the Omakase menu include the likes of the Tuna Belly topped with Chopped Tuna, Caviar and Gold Edible Flakes; and the Foie Gras with Uni. The former is a melt-in-the-mouth and umami filled sensation, while the latter’s flavour is overpowered by the rich foie gras taste. It is the pity for the Uni, which was overshadowed by the foie gras. For desserts, we had the Mochi Jelly which is part of the Omakase menu. Rants Suffice to say, prices are quite steep at Hiryu, be it for the Omakase course or the ala carte menu. Will I Return Again? The food at Hiryu is modern Japanese, while staying true to the principles of using premium ingredients. Dishes are generally very good, though be prepared for a splurge here. In terms of presentation, yes!